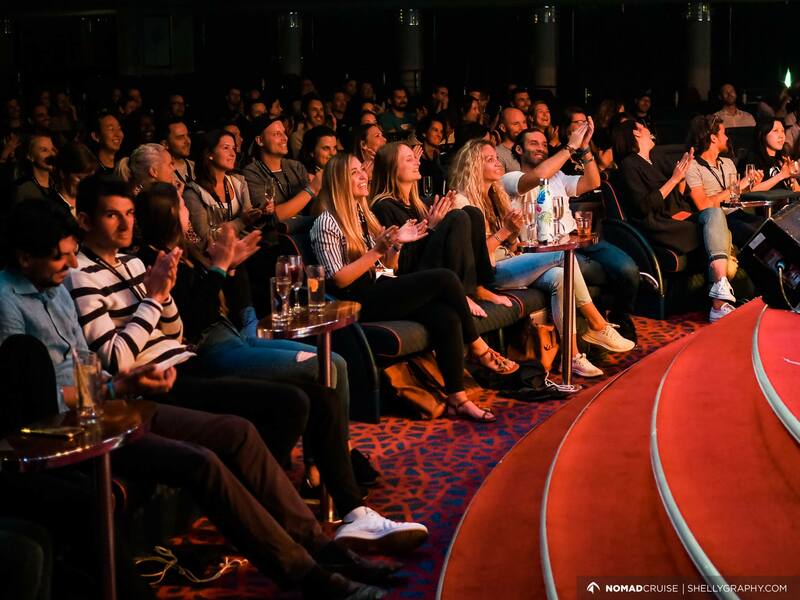 Nomad Cruise 8 was the 2nd edition of our European cruise. Our journey started from Las Palmas, a sunny beach town in Gran Canaria as well as a digital nomad haven. Many of our cruisers arrived early to enjoy the warm touch of the Spanish sun, which gave us a great opportunity to host several meet-ups and already get to know each other over some delicious tapas, engage in exciting conversations during our Speakers’ Dinner, and mingle at our Farewell party before the big day. Some took early bonding to the next level and decided to kick off their adventure by zip lining and paragliding over Las Palmas – what a way to start one’s journey of a lifetime! On the 6th of April, we set sail in the direction of Lisbon. 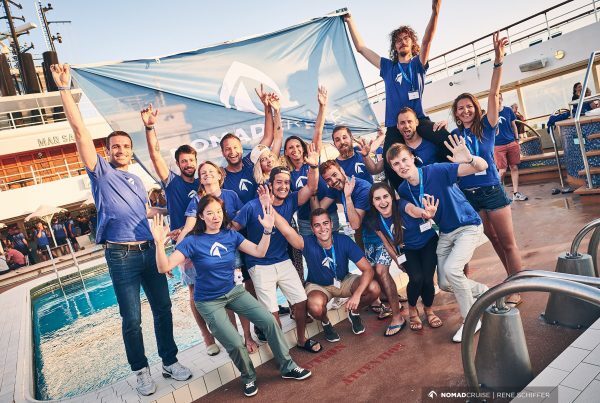 It was a lot of fun to welcome all our 222 participants on board and to see their smiley faces when they embarked their home for the next week. 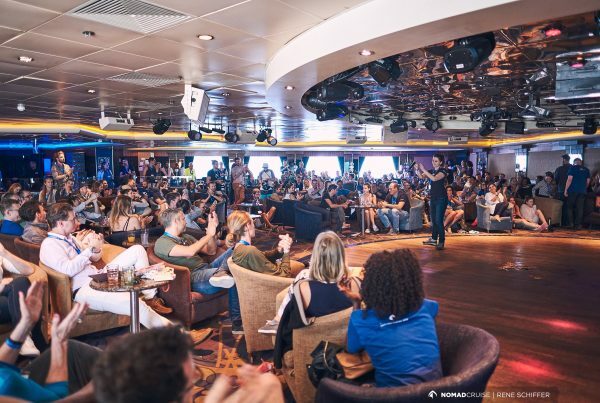 With only 7 days on board, Nomad Cruise 8 was shorter than our previous cruises, but not less fun at all! Our itinerary was packed with excellent keynotes, talks and workshops, focusing on a different topic each day. We got practical tips on how to leave the cubicle behind, had a great panel discussion about creating true value, deep-dived into performance marketing and mastered minimalist packing hacks so that we can travel the world with our carry-on luggage. You can see the full list of speakers & topics here. This time we enriched our program with two new events, and we’re happy we did! 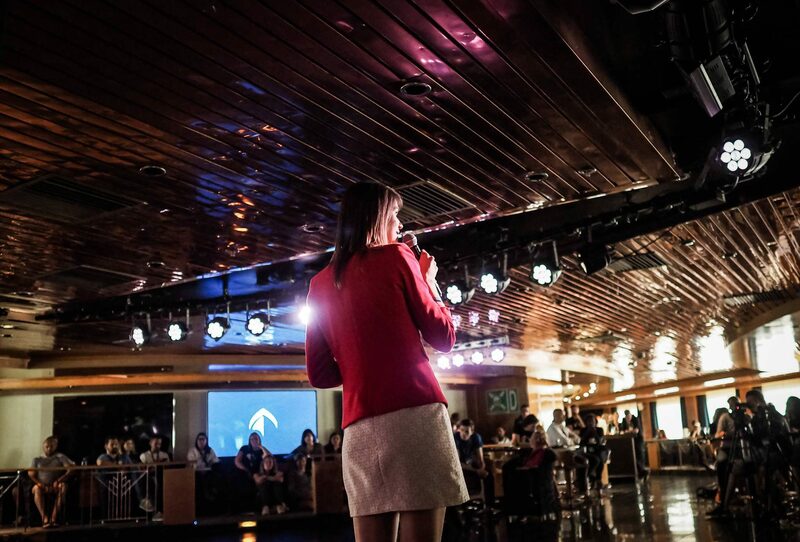 The feedback was amazing, so we will definitely include them on our next cruises as well:) In our Business Break-Through Session 20 participants pitched their business idea in front of a jury, then 6 of them presented it on stage in front of 200 cruisers. In return, they received valuable feedback from the jury on how to get their business idea to the next level. During the Speakers’ Challenge 30 participants overcame their fear of public speaking in a workshop, then 10 brave volunteers performed on stage in front of the full audience. The result was a standing ovation and a life-changing experience. The daily input of legendary speakers and amazing topics got us greatly inspired. We engaged in thought-provoking conversations about lifestyle choices, business development opportunities and personal productivity. We were super happy and excited to experience how these discussions and initial connections transformed into true bonds during the salsa workshop, speed networking, deep connection workshop and the talent show. 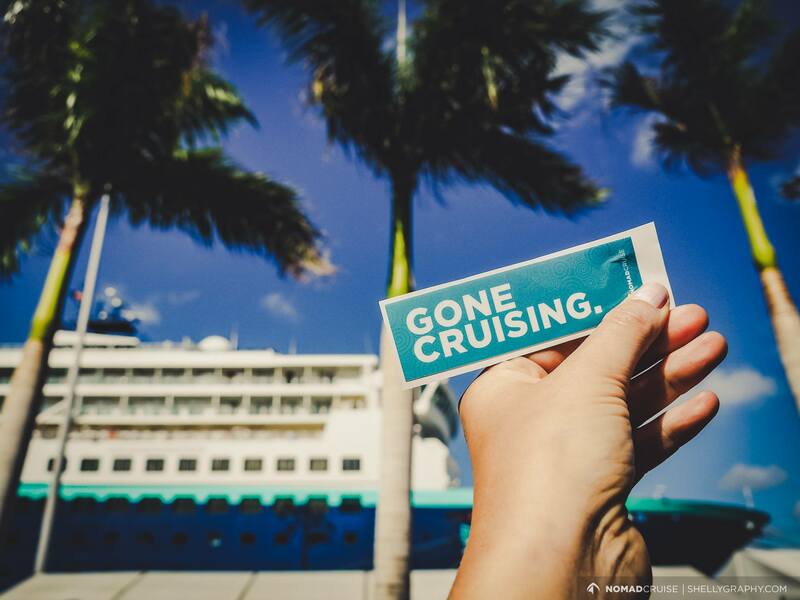 After all, this is what the cruise is about! The excursions are another great way to connect on a different level. Our first stop was on the beautiful island of Tenerife, where we split up in several groups and visited the most beautiful spots on the island. 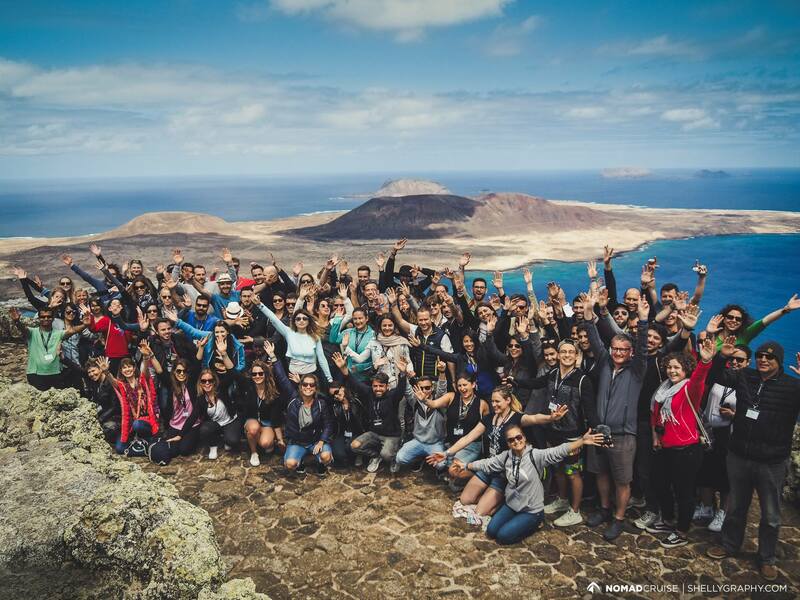 Most of our cruisers went on a tour through the Teide National Park – a UNESCO World Heritage site and one of the most visited National Parks in the world – and enjoyed some breathtaking views on the volcanic landscape. In Lanzarote we explored the Valley of a Thousand Palms and immersed ourselves in the extraordinary panoramic view over the strait of “Río” towards the archaic island of La Graciosa. 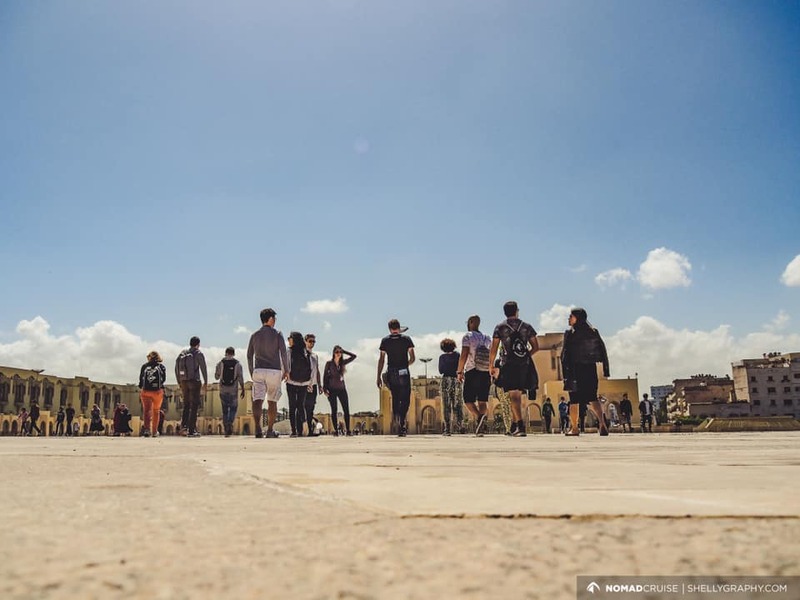 Before arriving at our final destination Lisbon, we dipped our toes into Africa as we visited the world-famous city of Casablanca in Morocco and we made one last stop in Càdiz, an ancient port city in the Andalusian region. 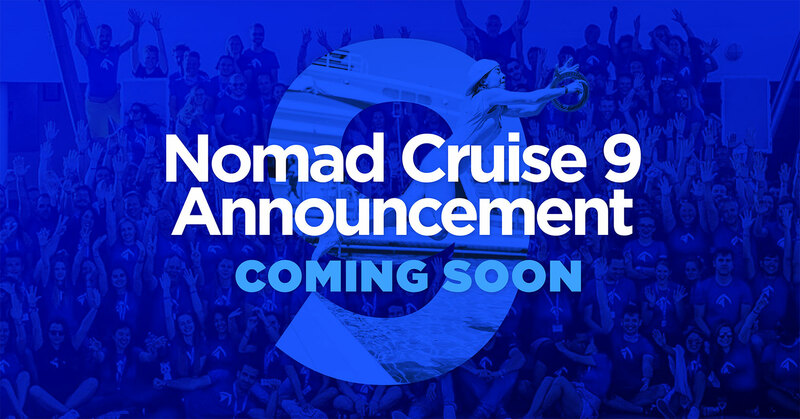 If you missed this cruise, don’t worry: soon we’ll announce the route and details of our next journey, Nomad Cruise 9! Join this event to be the first to know where our next trip will take us!